Entries close in just over one week for the International Landscape Photographer of the Year, a new global competition to showcase the best landscape photography. Don’t miss your chance to be one of the 101 inaugural winners! Open to all photographers from around the world, the contest will award the best 101 landscape images from the past 12 months and publish them in a beautiful coffee table book which will be available in a variety of formats, including a free eBook. The judges will also be on a search for the International Landscape Photographer of the Year (based on a folio submission of at least 4 images) and the International Landscape Photograph of the Year (being the best single photograph). Prizes on offer include $10,000 cash, trophies, limited-edition copies of the awards book and large framed prints of winning images (courtesy of our sponsors Momento Photo Books and Created For Life printing and framing). However, the contest closes on 30 May 2014, just over one week away! 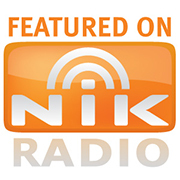 Each entry will be scored by all judges on the panel and receive a score out of 500. – the ‘HOT’ Location Award. The first ‘HOT’ location in 2014 is ICELAND! As clearly noted in the email, this is the first time this competition has been run and that got me thinking about it’s title and why we might need yet another photographic competition and so I decided to dig a little deeper. My spider sense started tingling when I started looking into the rules. In my mind a competition that calls itself the International Landscape photographer of the Year should be about the photographer’s ability to capture incredible landscapes in the field (at least thats my assumption and I was clearly naive in this case). Unfortunately, the competition isn’t necessarily about that at all. Since the rules of this new competition clearly state that anything goes in post production. 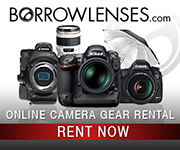 So we are not just talking HDR or multi image composites, we are literally talking – ANYTHING. 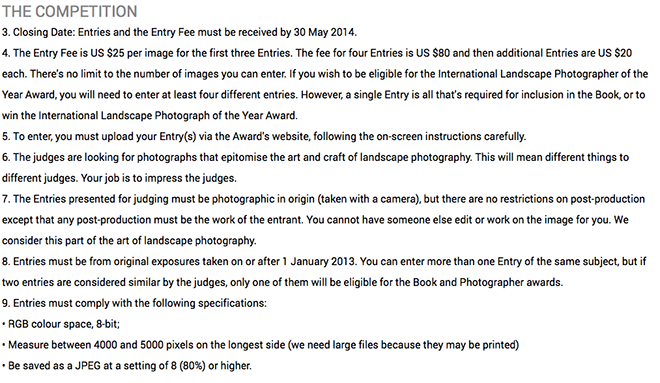 Sorry folks, thats not a landscape photography competition – thats a Digital Art award. When you open up the flood gates on post production you invite such a broad range of work that any meaningful comparison between the skills of the different photographers in the field becomes utterly meaningless. We are now awarding their skills in post production as retouchers and not their skills to capture landscape imagery in the field. Anything is possible these days in Photoshop. Just search You Tube for examples and you will find digital artists who have created a image of a beautiful woman from a photograph of a slice of pizza (I am not kidding). To quote the rules: The Entries presented for judging must be photographic in origin (taken with a camera), but there are no restrictions on post-production except that any post-production must be the work of the entrant. You cannot have someone else edit or work on the image for you. We consider this part of the art of landscape photography. I have to respectfully disagree with whoever made the statement that this is part of the art of landscape photography. To my mind at least, the ‘art of landscape photography’ is in the photographers ability to see and capture an incredible landscape photograph in the field. Not to create one on their computer. There is a very good reason renowned and respected competitions like Natures Best Photography and BBC Wildlife Photographer of the Year demand the RAW file if you are fortunate to make the finals. It’s because the competition is about the photographer’s ability to capture an incredible image in the field. Its most definitely not about their retouching skills back in the studio. I don’t need to elaborate on the rules for these competitions here; you can read them on their respective websites. Suffice to say I feel they are the gold standard in terms of competition rules that others might do well to follow. It is true there is absolutely nothing to stop anyone entering this new competition with purist photography (and good luck to them if they do). My issue with this new competition and these ‘anything goes rules’ is it pits what might be purist photography that a photographer worked incredibly hard to achieve in the field against the skills of the photographer in Photoshop to create something that did not exist. And that makes it a basket case of a competition in my book. There is just no way for any judge, no matter how experienced to accurately compare the photographic skill of the entrants when the parameters are so broad. By the time I had finished reading this section of the rules I knew this new competition was not for me. I suspect that many photographers will enter this competition somewhat naively and perhaps be drawn by its enticing title when they do not fully understand what they are really competing against. The final alarm bell rang when I got to the entry fee for this competition. At eighty dollars for four digital entries that is significantly more expensive than many well established competitions in the market place (Natures Best and BBC wildlife Photographer of the Year come immediately to mind; but there are also many others). 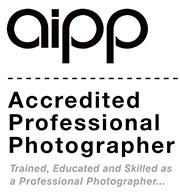 To my knowledge APPA (the Australian Professional Photography Awards) are one of the most expensive in the world. But thats a competition where the print is judged (in most categories) and there are very significant expenses associated with running this competition so the cost is justifiable. APPA also openly states it does not run at a profit. In this instance we have an entry fee of $25 per image for the first three images and then an $80 offering for four image entry. Additional entries after that are permitted at $20 and uncapped. So, if you are keen and have the budget you can certainly stack the odds in your favour with multiple entries. There are some significant cash prizes in this new competition and that will no doubt entice people to enter. In fact there is a total of $10,000 USD on offer across a range of prizes and thats not to be sneezed at. If we divide $10,000 by $80 (the cost of entry for four images) we get 125 entrants and thats not a lot. And thats before we take into account single image entry income. I blogged a little while ago about competitions that are set up to generate potential profit for the owners and you can read my thoughts on that HERE. If a competition is being set-up as a business and to make a profit that is returned to share holders it should be clearly indicated in my view. If all of the profits are supposed to be returned to the entrants in terms of prize money (which does not appear to be the case here) then the prize money should be a floating element dependant on the number of paid entries. Incidentally, competitions where the owners of the competition business are also judging the entries are operating somewhat unethically in my view. This is a grey area, but I think its questionable ethics to own or part own a competition that operates as a business and also act as a judge. 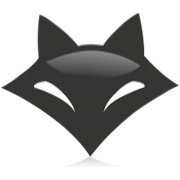 Edit – Just as a Post edit: I noticed this comment in the FAQ on the website: What are my chances of winning? Chance does not enter into the process as it is based on the judges’ assessment, but we expect to get several thousand entries. 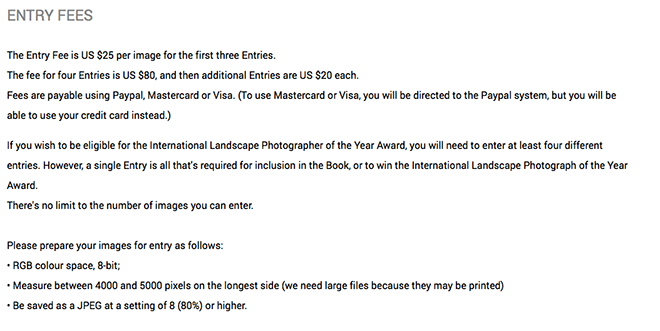 The end result of this new competition is that someone, somewhere is going to be crowned ‘The International Landscape Photographer of the Year’ and we will likely have absolutely no idea what their skills are like as a photographer in the field. We do know the work will likely be outstanding as its going to be voted on by a panel of highly respected and renowned photographers (some of whom I have immense respect for), but the work may well be a complete fabrication on reality and in no way reflect the skill of the photographer to capture a great image in the field. International Landscape Photographer of the Year seems like a pretty hefty title to me and I would like to have thought that it would be awarded to the photographer who demonstrably demonstrates their skills in the field to capture an incredible landscape photograph and not to the photographer who artificially creates the best photograph on their computer. I contacted the operators of this new competition and expressed my concerns and was told I was being somewhat judgemental. So, rather than belabour my point any further – You be the judge: International Landscape Photographer of the Year? Or, International Landscape Digital Art Award of the Year.